Units of time are measured for a reason‚Äìto keep the chaos of daily life at bay and at a minimum. Consider the extent of disorder if universally agreed upon divisions of time weren’t the norm. Everything from appointment schedules to driving safely in rush-hour traffic with signals adjusted for volume would be impossible to achieve. In ancient times, a stick cast a different series of shadows as the sun moved across the sky like an Egyptian obelisk dominating the skyline. On another continent, the details of the Mayan civilization’s fixation with time were etched on the Kukulkan pyramid at Chichen Itza, and we can certainly identify with their near obsession with the subject. Other precursors to modern timepieces were intricate water clocks used in ancient China, Babylonia, and Egypt. Or imagine patiently watching the sand filter through an hourglass or comically observing a Fred Flintstone-type with a spiffy mini-sundial strapped to his wrist. Nowadays, you can shop for a decorative sundial at the local garden center without needing to rely on its accuracy. Our body’s internal systems operate on a 24-hour cycle with fluctuations in temperature, blood pressure, muscle strength, alertness, and reaction times to stimuli adjusting accordingly. There’s even a fancy word to describe it: ‘chronobiology,’ the study of our circadian rhythm. Monitoring the ups and downs of our bodies and knowing when we’re at our natural best or worst can give us a competitive edge and great wristwatch can help keep track of those specific hours. 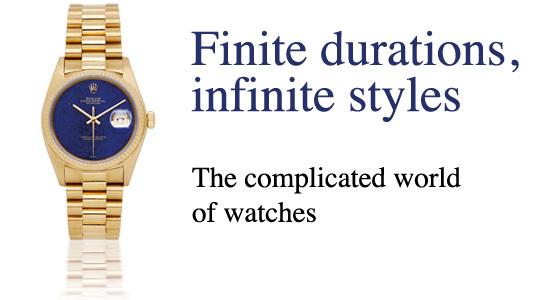 Is a well-crafted timepiece an item of jewellery or is it a practical and necessary accessory? Stylish or functional (or a bit of both) depends on the model and its level of technical capability and workmanship. Complications in day-to-day life are usually considered to be negative, but in the world of fine watches, they‚Äôre a plus. In horology, ‘simple’ movements measure hours and minutes. Anything beyond that is considered ‚Äòcomplicated‚Äô, and it‚Äôs these features and functions on a chronograph for example, with its innovations and multiple dials, that stretch the limits of both technology and imagination. French for whirlwind or vortex, tourbillon is a type of complication that regulates accuracy, with power reserve dials indication how long before the watch needs to be wound. Patek Philippe‚Äôs marvelous ‘annual calendar’ comes complete with two subsidiary dials for the day of the week and the month, has apertures for the date and the phases of the moon, and a power reserve indicator, along with a skeleton caseback. It‚Äôs a real conversation starter from any angle. In the ‘If I ever win the lottery’ fantasy, you could have your pick of a resale Vacheron & Constantin ‘Tour de L’Isle,’ with only seven made in 2005 and selling for $1.5 million a piece. 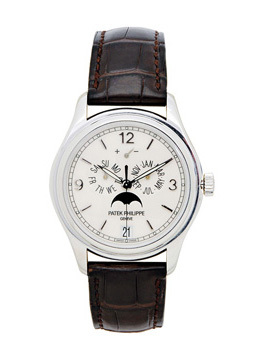 Maybe you‚Äôd prefer a nice vintage Patek Philippe super-complication designed in 1932 for an American banker that sold at auction for $11 million. It has 24 complications, including a chart of the starry constellations pertaining to his place of residence. For a less elaborate esthetic, an attractive blue lapis lazuli dial with a single magnified aperture decorates a Rolex ‘Oyster Perpetual Datejust’. 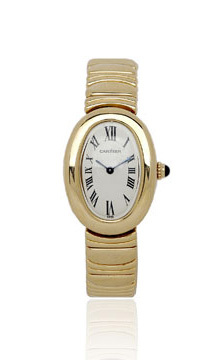 The gentle curved oval on Catier’s ‘Bagnoire’ caresses the wrist. Plain never looked so pretty. If you’re of a certain age, you might remember ‘banker‚Äôs hours’, when financial institutions were open only from 10 a.m. to 3 p.m. It was a phrase delivered with a mix of frustration and envy. How times have changed. Everything is 24/7 these days and knowing the time is a matter of taking a quick glance at a cell phone or looking down at the corner of a computer screen. However, the wrist will never become redundant. Whether you need to measure speed, distance, or plain old time, your choice of wristwatch indicates a great deal about you, your status, budget, and taste. With the myriad variety of brands and price points available out there, why not help your clients choose carefully, and often.